News > School News > AAS Community Supports Mr. Valeriy! AAS community members are supporting Mr. Valeriy, our longstanding dance teacher, after a devastating fire at his country home. It is with a heavy heart that we share with our alumni community that longtime AAS Dance teacher Mr. Valeriy Trofimchuk experienced a devastating fire at his country home. Mr. Valeriy lost his wife in the fire and was seriously injured. His young daughter Masha also received burns and went through surgery but is now doing better. Mr. Valeriy was initially in a coma as a result of his injuries but is now awake and undergoing treatment at the hospital. Our AAS community continues to show tremendous support, helping Mr. Valeriy and his family where needed. Within days, we received donations of many items Valeriy and his family needed to replace the items lost in the fire. AAS parents and staff donated over 300,000 rubles within weeks of learning about this devastating fire. 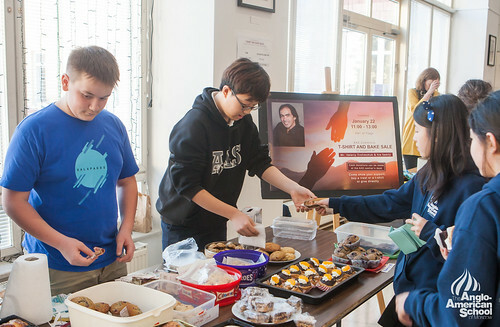 AAS students across all divisions organized a fundraiser bake and t-shirt sale, raising over $4000 dollars. Our thoughts are with Valeriy and his family during this very difficult time. AAS faculty and staff have set up a PayPal fund to support Mr. Valeriy and his family. You can donate here: https://paypal.me/pools/c/8byUTUp0TH and the fund will be cashed and delivered to Mr. Valeriy in June 2019. Please note that the PayPal fund is an initiative of a group of AAS employees and is not a registered charity or fund. Click on the image below for a photo album of the recent student fundraiser.